The National Retail Federation’s (NRF) Big Show & EXPO wrapped up last week, with over 35,000 attendees leaving the Javits Center in New York fresh with inspiration. From numerous aisles showcasing the latest retail innovations and technologies, to hours of strategy discussions at the conference – there was lots to take in. 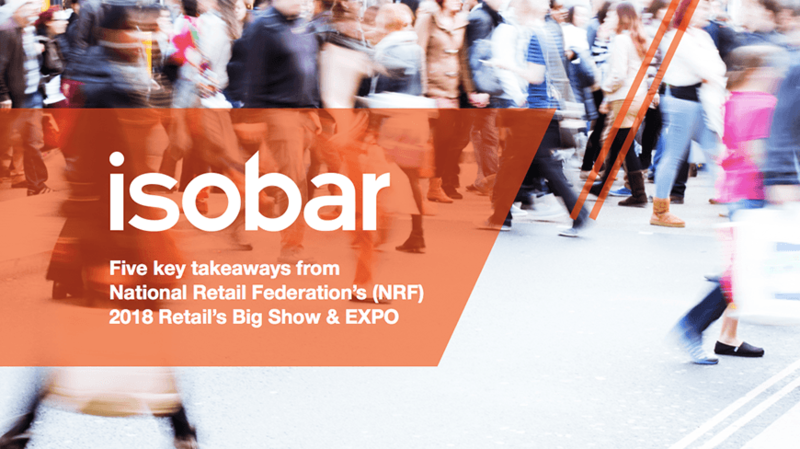 “Coming immediately after the critical holiday trading period, NRF’s Big Show provided a timely view of the priorities within the retail environment, at both a strategic and investment level for the year ahead,” notes Alex Hamilton, Head of Insight at Isobar UK. “It also provided a unique opportunity to better understand the direction some of the world’s largest technology companies are heading through an innovation lens,” Hamilton adds. The underlying theme throughout the event was that retail is undergoing a huge transformation, and consumers are not willing to wait for retailers to keep up with their rapidly changing shopping behaviours. Download our ‘Five Key Takeaways from NRF’s Big Show & EXPO’ to learn more.